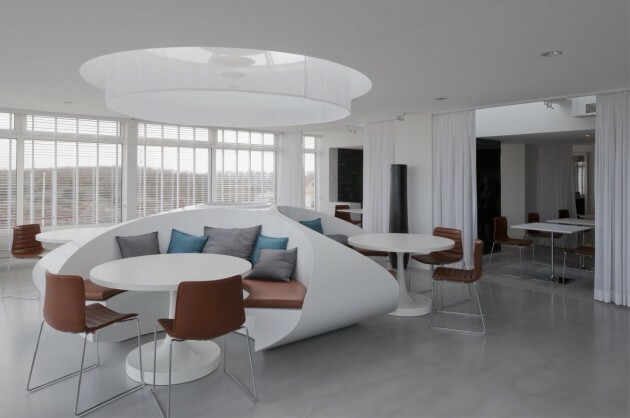 Lieven Musschoot has designed the Pure C bar in Cadzand-Bad, The Netherlands. Design a restaurant for everyone, a relaxed atmosphere in which the family is central and parts priority is. It’s a casual bistro atmosphere with lots of light, white interior and nature elements. The whole interior is tailored to the sweeping views from the impressive scenery around the north sea with the dunes. Formerly was the hotel restaurant which dated from the years 1970. In total, Pure C has a capacity of 180 persons. 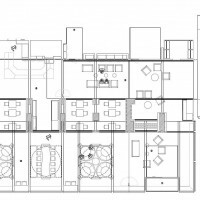 The space divided into different zones with a flexible organization that allows many different scenarios. Guests have the choice between long tables in black wood trunk for large groups or small tables for two that can be discreetly screened with airy white curtains. Who particularly interested in the surrounding scenery can chose a small table by the window. The most notable highlights are the large oval sitting island which is manufactured from mdf and lacquered in white. The cocoon effect is accentuated by an elegant white curtains round the perimeter of the cupolas. At night the skylights have a golden shine from the gold-covered with circular discs of light fixtures. It is consistent with material color and mood contrast played. This gave the most open part of the restaurant, on the sea-side a light grey epoxy floor, compared with this, the middle zone, areas with lounge chairs are in white oak parquet. 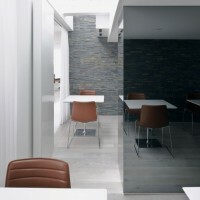 The black glass walls define spaces away without losing contact. The bar area was unlike the other areas not white but a black stretch acoustic ceiling. The furniture is all white with shiny brown tones combined. Brown wood tones are complemented by the vintage cognac-colored leather seat covers, front desk and bar. 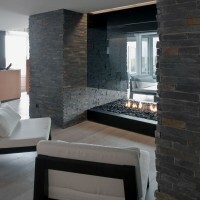 Other atmosphere are the gas fireplace with floating glass, the dark slate of the pilasters, vase objects (atelier vierkant) and lounge furniture from Piet Boon and Max alto. Visit Lieven Musschoot’s website – here.